Lately I’ve been craving white chocolate macadamia nut cookies, in a bad way. I don’t know what started this craving, but it has been all I can think of. When I was younger they were my favorite cookie. In fact the only cookie I really liked. As a special treat my mom would by them for me from The San Francisco Cookie Company in the mall. They were always warm and fresh. Soft medium rare center and crispy buttery edges. These cookies make me swoon. To satisfy my cookie craving I decided to bake muffins. Doesn’t seem to make sense but it does. 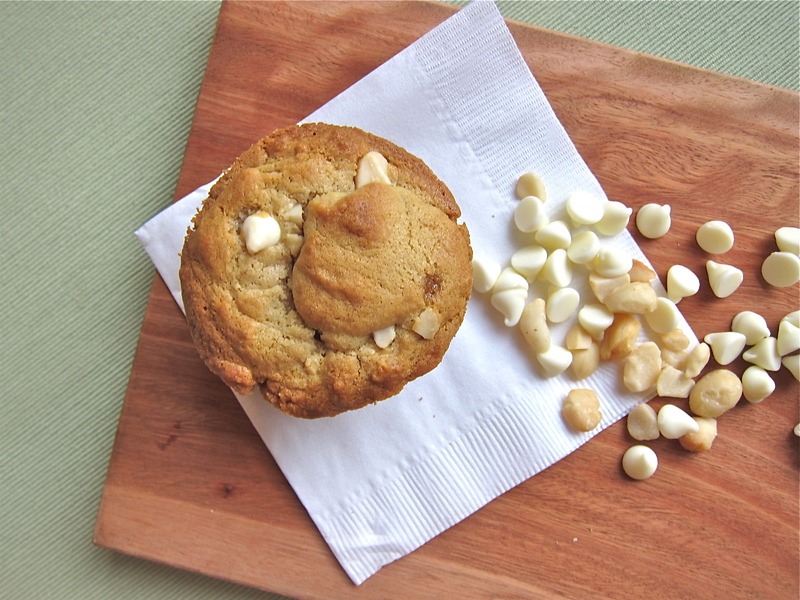 I baked white chocolate macadamia nut muffins and they tasted just like the cookies. Cookies muffinized! The center of the muffin was a touch gooey, the edges were crispy, the white chocolate melty, the macadamia nuts warm and tender. It was delectable. Craving satisfied in muffin form. Grab a glass of milk and whip up some muffins, in thirty minutes (start to finish) you’ll experience sweet satisfaction. Preheat oven to 350°F. Grease twelve muffin cups or line with muffin papers. Sift first 4 ingredients into large bowl. Combine sour cream, both sugars, butter, milk and egg in medium bowl. Mix into dry ingredients. Fold in half of nuts. Divide batter among prepared muffin cups. Sprinkle tops of muffins with remaining macadamia nuts. Bake until muffins are golden brown and tester inserted into center comes out clean, about 25 minutes. Transfer muffins to rack and cool. Genius! The white chocolate macadamia nut cookie is so underrated… always in the shadow of chocolate chip. I always forget how good they are too until I eat one! Will have to try this muffin recipe soon! Elder daughter is a macadamia nut LOVER. I will definitely make these for her when she comes to visit. They look wonderful! Glad you got your craving satisfied. This is one of the only ways I can enjoy white chocolate. This is such a good idea! LOVE white chocolate mac nut cookies (obviously) and now can’t wait to try to make these! Mmmmm what a great way to get around eating cookies for breakfast. Love this combination, and I imagine it goes AMAZING with some java juice. These muffins look killer! I love that you took your cravings for a cookie and turned it into a muffin. I gotta tell ya, I think I’d prefer this muffin over the cookie, any day.